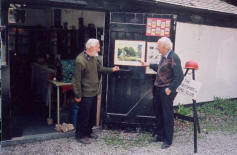 In the 1990s, members became interested in having somewhere to display the Club's activities on the surface and the opportunity was taken of borrowing a lean-to garage at the back of the Wizard. With a bit of work, doors were hung and a floor was put in to provide a reasonable space for some displays. Cabinets were obtained from various sources including Manchester Museum and were supplemented with old tables and cupboards. This worked well for a time and the main keepers of the museum were Tom and Todge (see left) helped by Granville and others. The next stage of it's life included the complete excavation of Tom's Shaft so that visitors can now see directly into one of the mines. This has proved a strong attraction but a minor problem as the warm air from the mine in the winter leaves a lot of condensation in the building. It also presented another problem in that the architect for the refurbishment, not knowing about the mine, put the door very close to the shaft. This was cunningly corrected one weekday when three members removed the wall, complete with door and turned it round 180 degrees. Other improvements followed including lowering the work surface. More recently, new frames have been obtained and smart posters have been printed displaying features of the main mines at the Edge. We have also added a computer which displays pictures or the Club website. With support from Syngenta, we were able to have all the glass in the cabinets professionally laminated making it safer and more resistant against accidental breakage. 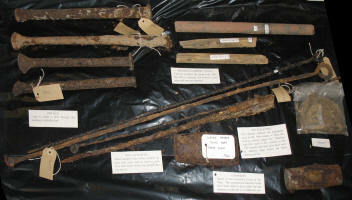 All items in the museum have also been photographed and logged (see the finds page on the Club members' area of this website). 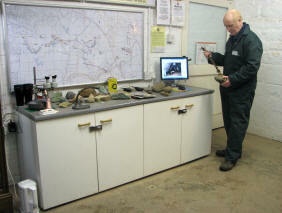 On the left, the picture shows Phill holding a replica stone hammer. Manning the museum is a voluntary service by the Club and we currently have various willing members who will be there on a Sunday. 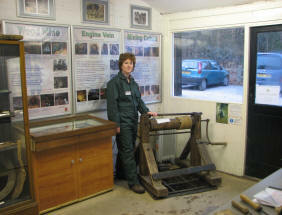 Visitors to the museum are able to get information about the mines and how to arrange visits as well as seeing the minerals and tools of the old miners. 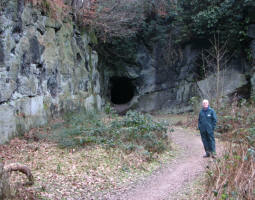 When possible, the museum attendant can take visitors for a short walk from the museum into Church Quarry to look at the mine tunnel there. The museum is open most Sundays from 9-ish until 3:30-ish (later in summertime). The museum can also be opened up during the week by arrangement. Please contact the Club by emailing the curator (Museum [at] DerbysCC.org.uk) for more information. 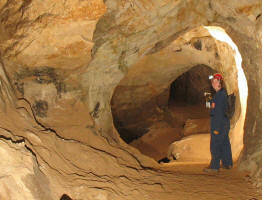 Above: left - Phill outside the mine tunnel in Church Quarry, centre - one of the display cabinets, right - Elaine in West Mine.